With production continuing on Ant-Man and the Wasp in Atlanta, new set photos emerged over the weekend, offering a better look at Paul Rudd and Evangeline Lilly in their full Ant-Man and Wasp costumes, without the masks. There are also new photos that show Michael Douglas' Hank Pym, who is seen in some photos wearing an FBI hat and jacket, although no details about why he's supposedly working for the FBI have been revealed. Plot details have been hard to come by ever since production started in August, and unfortunately, there isn't much to be gleaned from these images either. Ant-Man and the Wasp began production in August, with shooting taking place in both Atlanta and San Francisco, although it isn't clear when filming will wrap. The sequel opens in U.S. theaters on July 6, 2018. The story is set in the aftermath of Captain America: Civil War, where Scott Lang (Rudd) grapples with the consequences of his choices as both a Super Hero and a father. As he struggles to rebalance his home life with his responsibilities as Ant-Man, he's confronted by Hope van Dyne (Lilly) and Dr. Hank Pym (Douglas) with an urgent new mission. Scott must once again put on the suit and learn to fight alongside The Wasp as the team works together to uncover secrets from their past. 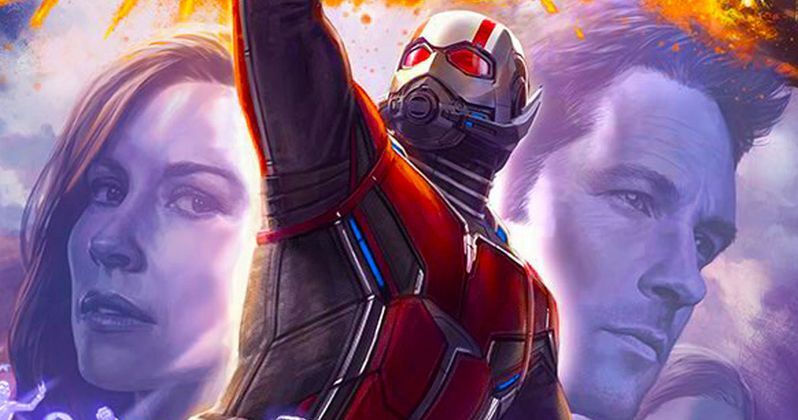 There was an Ant-Man and the Wasp casting call that surfaced a few weeks after production started, that hinted at a connection between this sequel and Captain America: Civil War. As you may recall, Scott Lang/Ant-Man (Paul Rudd) was one of the many heroes imprisoned in the Civil War aftermath, being held at a secret underground prison known as The Raft. The casting call sought actors to play convicts and prison guards for a shoot that took place at the end of August. While there was never any confirmation that this particular scene will take place at The Raft, it's possible this scene may show how Scott Lang and the rest of these heroes can find a way to make it out of this prison alive. Last month a new set video surfaced that showed Wasp doing battle with Ghost, played by Hannah John-Kamen, who was one of the new characters confirmed at Comic-Con along with Randall Park as S.H.I.E.L.D. agent Jimmy Woo, Walton Goggins as Sonny Burch, Laurence Fishburne as Dr. Bill Foster, a character who becomes Goliath in the Marvel Comics, and Michelle Pfieffer as Janet Van Dyne, the original Wasp and mother to Evangeline Lilly's Hope Van Dyne. They will be joined by returning stars Paul Rudd and Evangeline Lilly as the title characters, alongside Michael Pena as Luis, T.I. as Dave, David Dastmalchian as Kurt, Judy Greer as Maggie Lang and Abby Ryder-Fortson as Cassie Lang. The original Ant-Man movie wasn't a massive box office hit for Marvel Studios, but it still performed quite well, for an origin story that introduced the character to MCU movie audiences. The movie pulled in $180.2 million domestic and $519.3 million worldwide, from a relatively-modest $130 million budget. No budget figures were given for Ant-Man and the Wasp at this time, but it wouldn't be surprising if it was given a bigger budget. While we wait for more updates on this superhero sequel, take a look at the latest set photos, courtesy of Just Jared.